Everybody has bad driving habits whether it is smoking, checking social media, texting, leaving the steering wheel while you furiously search for something or taking a phone call, we have all been there and done that. There’s something really cool about being able to fly to South Africa and watch one of the most talented African footballers wearing a shoe on the field. Whilst we acknowledge these dangerous flaws in our driving society it is of the utmost importance to remember that during your driver’s test these habits are not tolerated by the K53 Scoring Method. With a scoring system which feels as old as the mountains and the development of modern technology you would expect that the traffic department has accepted that people will text and check social media, in today’s civilisation little small device are part of our being. While they acknowledge the use of our addiction to technology, they are also attempting to ensure safe driving skills and techniques, which means that although technology is developing, the scoring methods are here to stay. The scoring method is divided into two aspects, each of which can cause you to fail your driver’s test. As with any test there is a time limitation to the test, but unlike other tests, you will not be awarded points for correct behaviours (or answers) you will be awarded penalty points for mistakes. If you exceed 20 minutes for the inspection and yard test your test will immediately be discontinued resulting in an immediate fail, no amount of negotiations and persuasions will enable you to pass if you fail in the yard. Unlike the yard test, if you exceed the time limit of 45 minutes for the road test the examiner will stop the stopwatch and your test will discontinue, this does not mean you have failed the test it only means that you will no longer be penalised for mistakes but immediate fail items will still be applicable. When you exceed the time limit you will not be allowed to continue your driver’s test, resulting in an immediate fail. Furthermore, if you have been allocated more than 50 penalty points during the section you will also immediately fail the test. 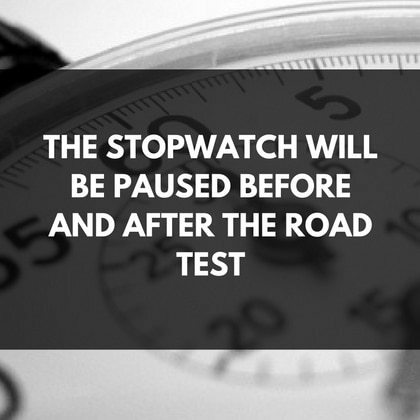 The stopwatch is paused before and after the completion of test manoeuvers when you are attempting to pass your driver's test, this is usually in times where you are delayed due to traffic in the yard or receiving instructions. Although the stopwatch has been paused immediate fail items are still valid. Your penalty points will be noted on a score sheet which is specific to your test. The amount of penalty point which you are allowed to be allocated without failing varies from the different sections of the test. If you receive more than the limited penalty points you will immediately fail the test. Remember to look in your mirrors, but not long enough to check the gel density in your hair or to see your smudged eyeliner it is just a glance, remember to smile and be friendly. These are small points which can make you fail if you forget to follow them correctly, so take note of them and pass your driver’s test with ease. Make sure you read how to get cheap 'car insurance quotes'. 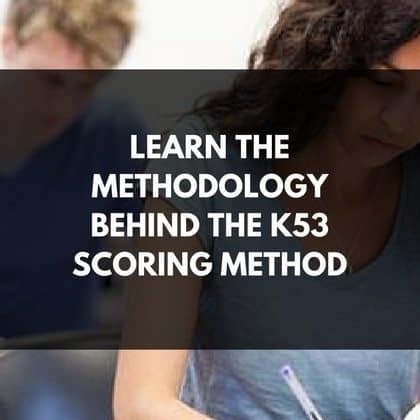 You might not know all the in’s and out’s of the K53 scoring method but we do, so contact us today to find out more about what else we know about helping you to pass your drivers licence the first time. Do not let bad habits stand in your way of freedom. Please read our other articles if you're looking for more information on the learners test and how to pass your learners.